The ISM indices continues to reflect very healthy conditions in the manufacturing sector, with the April reading exceeding already-high expectations. 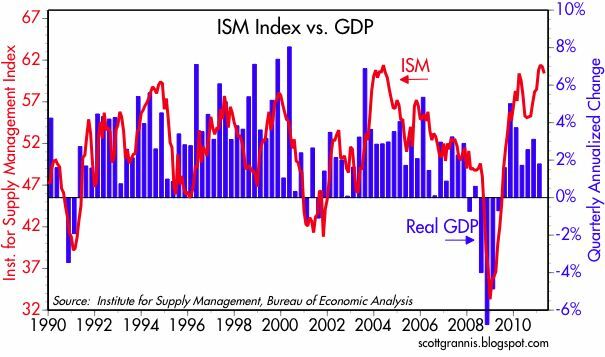 The chart above suggests that with manufacturing this strong, the economy should be growing at a 5-6% annualized rate, much higher than the meager growth numbers we have seen in recent quarters. 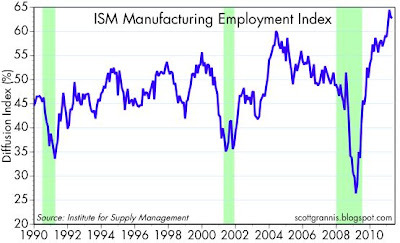 At the very least I think this suggests that economic growth should be accelerating over the course of this year. 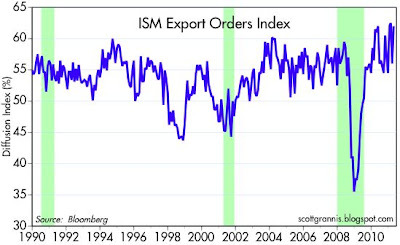 Export orders have been volatile of late, but continue to reflect fairly robust conditions. 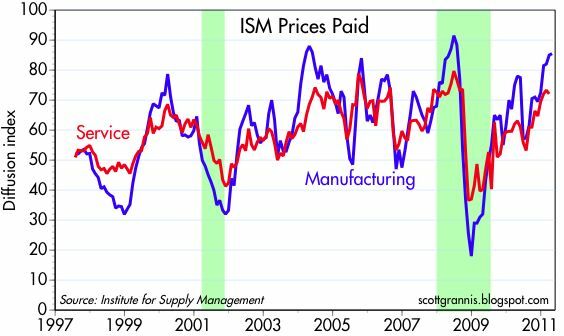 A clear majority of purchasing managers continue to report paying higher prices, which is not surprising given the rise in commodity and energy prices. This is bad to the degree that higher prices are being driven by accommodative monetary policy, but good to the degree that higher prices reflect generally strong global demand. The employment index continues to run at very high levels, higher than anything we've seen since 1972. I keep reading exports are helping manufacturing, due to trade-enhancing exchange rate of the dollar. 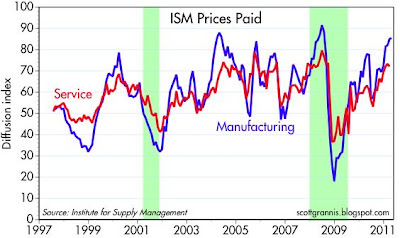 Is a new paradigm developing, in which a new trading range for the dollar enhances exports, and helps US employment? Fascinating report..the end of the commodities boom? "Silver futures on Monday plunged as much as 13 per cent, the biggest intra day drop since October 2008, as CME Group Inc raised the amount of cash that traders must deposit for speculative positions. Silver for July delivery dropped to USD 42.20 an ounce before trading at USD 45.455 an ounce on the Comex in New York." one day does not a market make, but commodities may have grown long in the tooth. It has taken the almost destruction of a wonderful currency (USD) to accomplish a minor blip. Sad.